Refined 2-channel alternative 60W amp to Onkyo A-9110 with WRAT, custom-made parts and Wolfson WM8718 DAC, perfect entry-point to authentic hi-fi music. 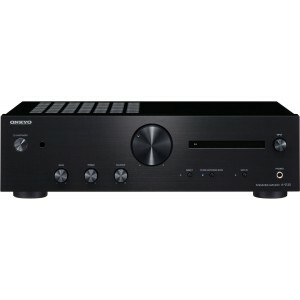 Onkyo A-9130 digital-audio-ready integrated stereo amplifier further refines the acclaimed entry-level A-9010, a pre-main amplifier that won an excellent reputation for musicality and dynamism in the global marketplace. The A-9130 (60W + 60W) delivers outstanding performance with custom-made or hand-selected parts, simplified and shortened signal-path topology, and specialised tuning to present a golden hi-fi sound. Dynamic changes in music cause impedance to fluctuate. If power can’t be delivered when impedance drops, sound quality suffers. Key to the amp’s lively dynamics is WRAT (Wide Range Amplification Technology), Onkyo’s time-proven high-current platform featuring high-output EI transformer, two large custom-made main audio capacitors and discrete power transistors. When playing music at low volume, the signal normally drops close to the component’s noise floor. The signal picks up noise, which is amplified, and the result is muffled sound. To avoid this, the A-9130 features Optimum Gain Volume Circuitry, a volume circuit that requires less than half the usual amount of attenuation. The signal never approaches the noise floor, so you can enjoy the clearest sound at low volume. Onkyo sound designers tuned this amplifier after repeated listening tests, achieving a warm, rich, and full tonal character sure to appeal to music lovers, the sound made possible with a blend of custom-fabricated and hand-selected high-quality parts. This bass-rich amplifier is very smooth and unfatiguing to enjoy for long periods. Ample connectivity comes with five gold-plated RCA line-level inputs and discrete MM phono equalisers. Coaxial and optical digital audio inputs are included with signals decoded by a high-end Wolfson WM8718 D/A converter supporting 192 kHz/24-bit audio playback. The digital audio board automatically shuts down when an analogue input signal is detected to reduce potential interference on the signal. The A-9130’s digital audio inputs are ideal for TV connection, giving a powerful boost to games, films, and TV sound. There is also line-level outputs, subwoofer outputs and top-quality non-magnetic speaker binding posts with clear knobs as well as a direct main power-amp input for connection of an external pre-amplifier. The A-9130 benefits from Phase-Matching Bass Boost, a unique loudness technology that aligns the phase of low- and mid-band frequencies above 300 Hz for richer bass and clearer vocals. Together with Optimum Gain Volume Circuitry, which requires half the conventional amount of signal attenuation to prevent interference from the amps’ noise floor, listeners can enjoy an unparalleled sense of clarity, depth, and vibrancy at low-level playback volumes. Direct Mode bypasses tone and PM Bass circuitries. In combination with a refined amp circuit design, signal-path-lengths have been significantly reduced in comparison to the A-9010 for even more accurate and faithful sound. Enjoy end-to-end analogue music reproduction from the turntable to speakers, and recapture the atmosphere of the original recording with any connected source. Tackling the effects of electromechanical resonance, the A-9130 features a thick 1.6mm metal chassis dampens vibrations and associated noise together with large insulators. The clean front-panel design is refreshed by a slim display panel showing active input, while RI (Remote Interactive) inputs on the rear panel unify system control with compatible Onkyo CD transports, digital tuners, and network streamers. The new display panel boasts fine text resolution, making it easier to read at a distance than single bulbs. It shows active selected input at a glance. Speaker cables with your choice of terminals are firmly secured by high-quality speaker binding posts. Each wide-spaced non-magnetic post prevents interference and features a large, easy-to-grip transparent knob.